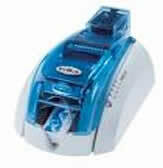 Ascot can supply a range of embossing machines to suit the whole host of plastic card applications. Whether the requirement is for magnetic strip or smart card personalisation we can provide a competitive solution tailored to individual requirements. Currently the range of embossing equipment we offer extends to CIM including the supply of operating and full system support. The Embosser 1000 is the ideal solution for a variety of personalisation needs a card embosser that combines desktop dimensions with heavy duty performance to successfully process various kinds of plastic cards. Performance up to 500 CPH. 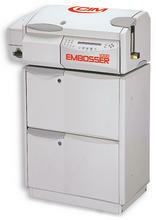 Equipped with the MSP system (Multi Smart Processing) allowing 3 cards to be processed simultaneously. FIFO (first in – first out) input hopper with a 200 card capacity. Available with special characters for the personalisation of international credit cards such as VISA and MasterCard. Reject hopper with alarm function for cards with encoding error. Ascot offers a range of thermal printing solutions to support both magnetic stripe and smart card technology. For all systems we are able to offer operating software and full system support. As part of the card issue programme Ascot can provide a range of hardware like magnetic readers and encoders both swipe as well as motorised sourced from global leaders.This single point facility allows the customers seamless integration as well as assured compatibility thus ensuring a smooth card issue programme.